Discussion in 'Sports' started by Swami, Aug 30, 2018. Just one week after Spa, F1 arrives at Monza this weekend - the cathedral of speed. Looks like the tifosi will be in some form if Ferrari win again. 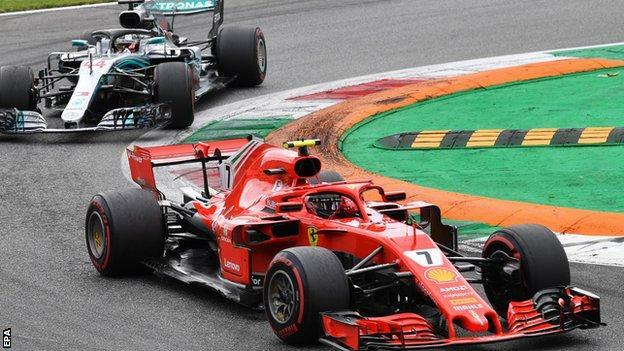 Ferrari's Sebastian Vettel set the pace in second practice at the Italian Grand Prix despite a high-speed spin. The German, 17 points behind Mercedes' Lewis Hamilton in the championship, lost control at the famous Parabolica corner at the end of an impressive run. Hamilton was third fastest, behind Ferrari's Kimi Raikkonen and 0.287 seconds slower than Vettel. 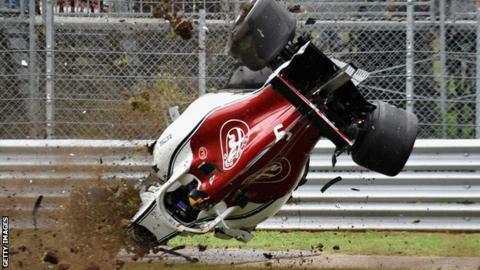 There was a huge accident for Sauber's Marcus Ericsson, who somersaulted several times at the first chicane. His DRS overtaking aid did not shut as intended when the Swede hit the brakes. Ericsson was uninjured but the DRS continued to be an intermittent problem for his team-mate Charles Leclerc for the first part of the session. Vettel was trying to get one more timed lap when he spun off, lightly tapping the wall. Hamilton also made errors on his fastest laps, running slightly wide at the second chicane a couple of times, so the absolute pace of the Mercedes was not revealed. "We did plenty of laps this afternoon in the dry and we could see that, like in Spa, we had a small gap to Ferrari on both the short and the long runs," said Hamilton. "My laps felt pretty good, but Ferrari was a little bit quicker today. We're all working flat out right now in every part of the team, and we have work to do tonight as well - but there are some areas where we can see deficits, so I hope we can make a little step for qualifying. "It has been a big battle for a number of races now, and they have had a small advantage since the middle of the summer, but we are pushing as hard as we can to overcome that." Vettel's advantage over Hamilton suggested that Mercedes are again on the back foot. And the race simulation runs in the second part of the session strengthened that impression, with Vettel on average just under 0.2secs quicker than Hamilton on high fuel on the super-soft tyres on which most teams will start the race. Vettel was out later than Hamilton because of the delay required to repair the light damage to his rear wing caused caused by his off at Parabolica. If that form continues, Mercedes will be concerned, because they already expect to struggle at the next race in Singapore in two weeks' time. "The car was working well today but I think we can still improve," said Vettel. "I am not yet happy. The balance is not perfect yet but I think by tomorrow with more work the car will be fine." On Friday, Hamilton was fighting a lone fight against the Ferraris - his team-mate Valtteri Bottas was nearly 0.7secs off the pace and just over 0.4secs off the Briton. The Red Bulls are next best, but Max Verstappen in fifth was a second off the pace. 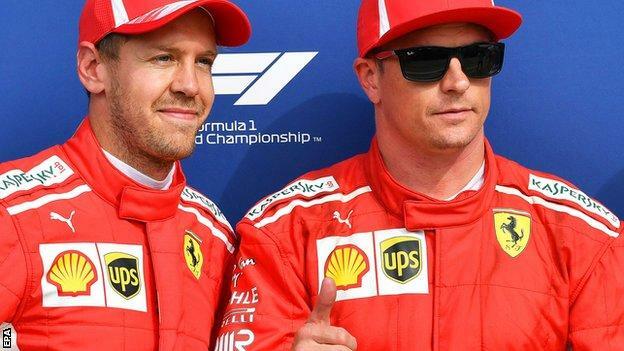 Ferrari's Kimi Raikkonen set the fastest lap in Formula 1 history as he stole pole position from the title contenders at the Italian Grand Prix. The 38-year-old Finn triumphed in a thrilling fight at Monza with team-mate Sebastian Vettel and Mercedes' Lewis Hamilton, taking pole with the last lap of the session. 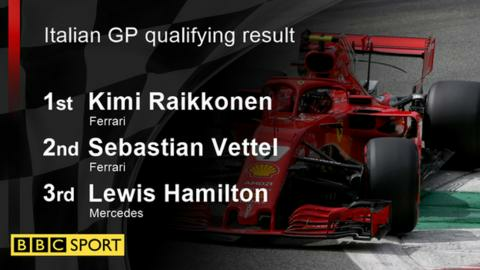 Hamilton was fastest after the first runs and improved on his second lap, but Vettel beat him before Raikkonen pipped both. Raikkonen's lap of one minute 19.119 seconds meant he averaged 163.793mph. The previous record - 1:19.525 (162.950mph) - was set by Juan Pablo Montoya in a Williams in 2004. Vettel was not happy, saying "we speak after" as his engineer told him the result. The German declined to elaborate when asked to say what he meant. In one of the most exciting qualifying sessions for some time, Hamilton fought to overcome what appears to be a slight Ferrari pace advantage and appeared at one stage to have done it. On the first runs in final qualifying, Hamilton set a 1:19.390, beating Raikkonen by just 0.069secs, with Vettel third just 0.038secs behind the Finn. Hamilton improved to a 1:19.294 on his final run, but the Ferraris had positioned themselves behind him, Vettel in front of Raikkonen, and the slipstream the second Ferrari driver got may have proved decisive. Raikkonen, whose pole was his first since Monaco last year, was pleased to set the quickest time on Ferrari's home track. He said: "I couldn't think of being on pole in a better race. I am hoping tomorrow I can end up in the same position." That remains to be seen, as Vettel is 17 points adrift in his close title fight with Hamilton. Vettel said: "Not entirely happy with my last run but Kimi was a bit too fast in the end. It is always like this in Monza, for him it was in the sweet spot. My lap was not very good but for now we have both cars on the front row." Hamilton said: "Ferrari did a solid job. We gave it everything we could, it is very close between us but they have had the upper hand this weekend. We will give it everything we can tomorrow. "It was so intense and that's how F1 should be." Hamilton's team-mate Valtteri Bottas, who has been off the pace all weekend, ended up fourth, 0.362secs behind the Briton. Red Bull's Max Verstappen, Haas' Romain Grosjean, Renault's Carlos Sainz, Force India's Esteban Ocon, Toro Rosso's Pierre Gasly and Williams' Lance Stroll completed the top 10. It was Stroll's best qualifying result since this race last year, when he was fourth in the wet. Speculation continues to surround the Canadian's future following the purchase of the Force India team by a consortium led by his father. Fernando Alonso was a surprising 13th in his McLaren, benefiting from engine penalties for Red Bull's Daniel Ricciardo and Renault's Nico Hulkenberg, which meant they did not compete in second qualifying, and by Force India's Sergio Perez getting knocked out in Q1. But Alonso had to report to the stewards to explain an incident when he tangled with Haas' Kevin Magnussen at the first chicane as they both disputed the same piece of track at the end of the second session. Over the radio, Alonso had said Magnussen wanted to race, to which Magnussen replied on BBC Sport: "I don't know what he's on about. He's clearly frustrated, trying everything he can, getting his team-mate to give him a tow everywhere. Today he tried to get a tow from me and he got too close. It didn't work out." Alonso responded that Magnussen had made a late decision to start a flying lap while in the middle of the final corner, Parabolica. Alonso said: "We were all together at the start of the lap trying to find a gap. In the last moment in Parabolica, Kevin decided to start the lap just in front of me and fill the gap between the two cars in front. I don't know why. "A late decision that maybe didn't make too much sense. If he decides that, maybe he thinks it is the right thing for him." The stewards decided no further action was required. 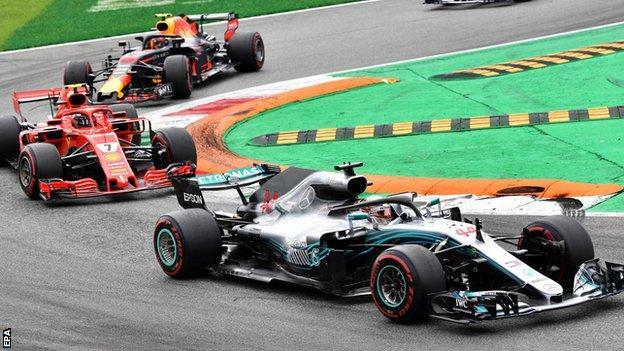 Lewis Hamilton took a thrilling and controversial victory in the Italian Grand Prix following a first-lap clash with title rival Sebastian Vettel. The Mercedes driver fought a cat-and-mouse battle with Vettel's team-mate Kimi Raikkonen throughout the race and eventually passed him around the outside of the first corner with nine laps to go. 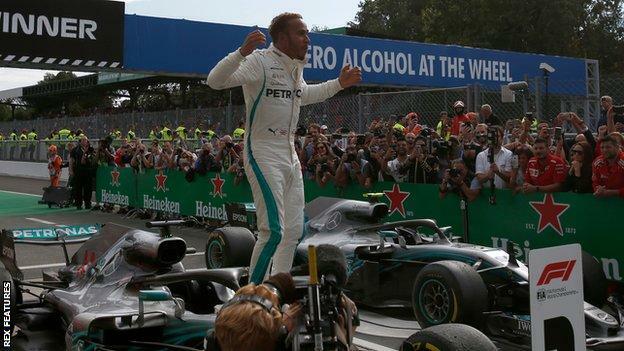 Hamilton and Mercedes not only dashed Ferrari's hopes of a home win after their first front-row lock-out at Monza for 18 years but also extended the Briton's championship lead over Vettel, who finished fourth, to 30 points. That is more than a clear win, with seven races and a total of 175 points remaining in the season. It could not have come at a better time for Hamilton, who is facing a fight against an apparently faster car - at least in qualifying - and with Mercedes' bogey track, Singapore, next on the schedule. Ferrari's race began to unravel within four corners of the start, as Vettel spun trying to defend against an overtaking move by Hamilton at the second chicane on the first lap. Hamilton took the outside line and was slightly ahead as they turned into the corner, after the German had had a little look at a possible passing move on Raikkonen in the lead. Vettel's car slid into Hamilton's in the middle of the chicane and he spun in front of the pack, his front wing broken. The Ferrari driver complained over the radio, but the stewards judged it a racing incident not worthy of further action. Vettel was left to recover lost ground and eventually took fourth - partly thanks to a five-second penalty for Red Bull's Max Verstappen, who finished third on track but was demoted to fifth after crowding Hamilton's team-mate Valtteri Bottas off the track. Hamilton said: "I want to give it up to Ferrari, who put up a great challenge this weekend. There was a lot of negativity here and I could see so many British flags out there, and they inspired me so much. "In future, the negative is only a positive for me, because I turn it around. "Big thank you for the team and also for Valtteri for helping me." The first-lap incident left the race as a battle between Raikkonen and Hamilton, and they fought tooth and nail throughout. Hamilton briefly took the lead at the restart after the safety car was introduced following the first-lap collision between the title contenders, and a retirement for Toro Rosso's Brendon Hartley following a collision at the start, but was immediately re-passed by Raikkonen. Mercedes than had to bring strategy into play. Once back into the lead, Raikkonen could not shake off Hamilton, the Mercedes following about a second behind throughout their first stint. Ferrari's concern was not to be beaten to a pit stop by Hamilton, as the Mercedes would then probably jump ahead. So they made sure to stop Raikkonen early, bringing him in on lap 20, with 33 to go. Mercedes chose to leave Hamilton out, to give him an advantage on tyre life and speed later in the race, and also decided to bring Bottas into the race. Hamilton ran until lap 28 before his pit stop, doing an excellent job in minimising the amount Raikkonen gained on him on fresh tyres. 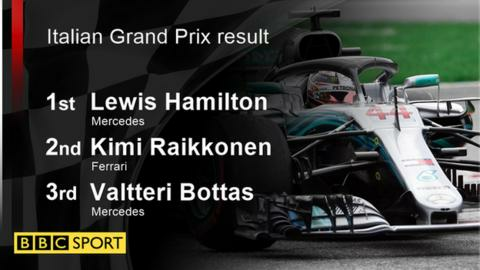 By the time Hamilton pitted, Raikkonen had caught Bottas and the Finn was used to hold his countryman back and give Hamilton a chance to catch up. 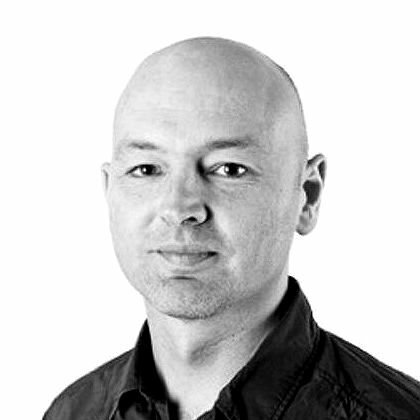 Bottas eventually pitted on lap 36, leaving Raikkonen and Hamilton nose to tail. But overtaking is difficult at Monza, despite the long straights, and although Hamilton followed closely he struggled to get past. As the laps ticked by, though, Raikkonen's older tyres began to give up, enabling Hamilton to get closer and closer, until on lap 45 the Mercedes went for the outside of the first chicane and pulled off another excellent pass. Mercedes were thrilled. "You are the man, you are the man," Hamilton's engineer Peter Bonnington said over the radio after the victory. "You knocked that out of the park today." Verstappen's penalty came as a result of a move he pulled defending against Bottas after their pit stops. He took the inside to protect the position, but moved back to the outside and pushed Bottas off track. He could have no real complaint about the decision to penalise him - but complained anyway, saying: "I gave him space." Bottas said: "It was hard racing, sometimes not as fair as I was hoping for but he got a penalty." The five-second loss dropped Verstappen to fifth behind both Bottas and Vettel at the end of the race. He held on ahead of Bottas on track, and told his team he knew he was losing time to Vettel behind but he "didn't care". It was a fitting tribute for one of Hamilton's best - and potentially most crucial - wins. Romain Grosjean finished sixth but Renault lodged a protest against "the legality" of the Haas car after the race. The Force Indias of Esteban Ocon and Sergio Perez came seventh and eighth respectively with Renault's Carlos Sainz ninth and Lance Stroll picking up a rare point for Williams in 10th. Daniel Ricciardo and Fernando Alonso joined Hartley in retiring. Singapore. Surely Ferrari must win there, on a track made for their car. But then the same was said before Monza - and before Singapore last year, when the Ferraris crashed out at the start. The stakes will be high, the tension higher. Can Ferrari fight back?